For decades, the Voting Rights Act slowed or stopped the efforts of states and localities to prevent voters in communities of color from casting their ballots, which included poll taxes, literacy tests, proof of citizenship requirements, selective polling locations, and voter intimidation. According to a 2015 Joint Center for Political and Economic Studies report, the racial gap in self-reported voter registration in former Confederate states shrank from nearly 30 percentage points at the start of the 1960s to 8 points by the start of the next decade. Despite some of the Voting Rights Act’s significant and resounding successes in voter registration, turn out, and the election of African American officials, in 2013 the U.S. Supreme Court gutted one of the law’s key provisions. Section 5—also known as the preclearance provision—gave the U.S. Department of Justice or a federal court the authority to check any action by state or local officials that may have a discriminatory impact on voters. This section was essential in protecting voters—especially people of color—from policies aimed at suppressing their votes. Within hours of the U.S. Supreme Court decision, Texas moved to implement a strict voter identification law that was passed by the state legislature in 2011 but blocked by a federal court and the U.S. Department of Justice under their preclearance authority. When jurisdictions want to dilute the people’s voice, they do not wait—they move quickly. Until the U.S. Supreme Court’s ruling, Section 5 was the best option available to help stop the quick movements by jurisdictions that suppress votes. Over the past three years, multiple jurisdictions have made it more difficult to cast a ballot. The poll taxes and literacy tests from 50 years ago have been replaced by state voter ID laws, reduced early voting days and hours, the elimination of same-day registration, voter roll purges, and shuttered polling locations—all justified under the guise of battling voter fraud. For example, North Carolina implemented a highly restrictive voter ID requirement; toughened the rules for provisional ballots; removed access to early and same-day registration; and closed one-third of early voting locations. Maricopa County—the largest county in Arizona—reduced the number of polling sites by 70 percent, resulting in voters waiting in line for up to five hours during the presidential primary earlier this year. In Texas and Utah, a concealed-carry license is valid ID to vote, but a student ID—even from a state university—is not. This September, Ohio attempted to implement similar purging practices. Rather than falsely listing black people as formerly incarnated individuals, the state removed thousands of voters from their rolls who had not voted in six years and did not return a mailer that asked if they changed addresses and if they were still active voters. This practice disproportionately affects those living in urban areas—including young professionals, students, and black people—who tend to move more frequently. 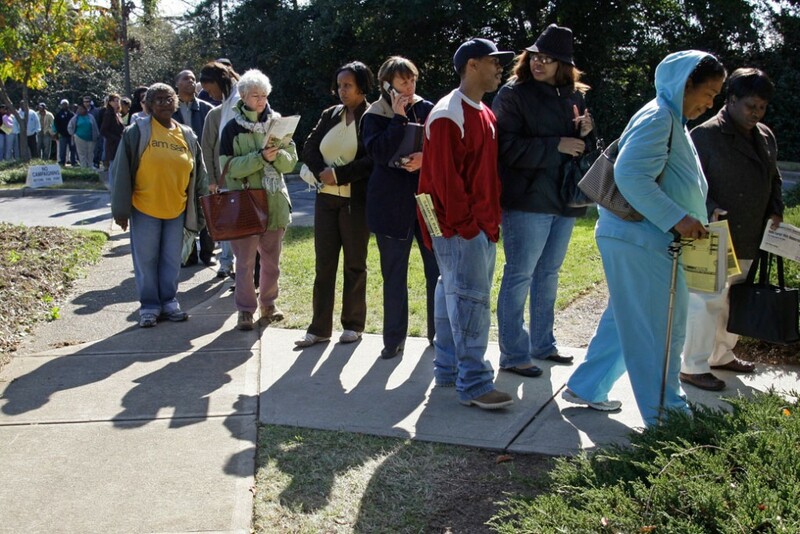 Moreover, this voter purge came on the heels of the elimination of Ohio’s so-called Golden Week—a period that allowed voters to register and vote early on the same day. Voting rights advocates sued Ohio’s Secretary of State for both of these actions. Although they lost the Golden Week case, the 6th U.S. Circuit Court of Appeals found that Ohio’s method for purging people from voting rolls violated the Voting Rights Act. Without the preclearance provision, the only way to stop these efforts today is through litigation. Unfortunately, litigation takes money and time, neither of which are infinite. The nation needs a legislative solution to ensure once more that all Americans have access to the voting booth. In the interim, federal courts have struck down many policy changes that are crafted to suppress voting by people of color. For example, in ruling on the North Carolina statute, the powerful opinion from the 4th U.S. Circuit Court of Appeals states, “the new provisions target African Americans with almost surgical precision” and “impose cures for problems that did not exist.” Additionally, a district court found that Texas’s voter ID law would prevent approximately 600,000 people—including a disproportionate portion of people of color—from voting. The 2016 presidential election is less than 40 days away. Analysts anticipate that the results will be close, underscoring how vital equal access to voting is in this election. The forces that want to dilute or suppress voters of color will continue to craft new policies and practices. Meanwhile, voting rights proponents no longer have a critical tool to stop those efforts in a timely and productive way. As Martin Luther King Jr. wrote, “human progress never rolls in on wheels of inevitability; it comes through the tireless efforts of men [and women] willing to be co-workers with God, and without this hard work, time itself becomes an ally of the forces of social stagnation.” In order for the reality of the nation’s democracy to be as good as its promise, all Americans must remain vigilant in making equal access to the ballot a reality. Danyelle Solomon is the Director of Progress 2050 at the Center for American Progress. Michele L. Jawando is the Vice President for the Legal Progress team at the Center.